When Halloween time arrives my whole world changes. I stop doing laundry and cleaning the house and I start making costumes. Over the years I have realized that this is a true passion of mine. I completely emerse myself in this activity and I really don’t think about anything else until it’s done. Every year for halloween we go big, but this year was the biggest by far. As a couple my husband and I have a friendly costume competition between another couple and ourselves. Every year our costumes are kept secret from each other until the big reveal on Halloween. This year we decided to tackle the costumes from the infamous ballroom scene in the Movie Labyrinth! This was very difficult because the scene takes all of five minutes of the movie to complete and you only see glimpses of the costumes, but between the movie and google I knew that I could create these costumes! Although we really like to go big for halloween we have always had to do it on a budget, so in the past I have thrifted most of the pieces for our costumes and sort of piece them together as I go. Often I will start looking for pieces all the way in January if we have decided on characters, but this time I knew I had to do everything from scratch! First I took an adventure to the fabric store to find the perfect patterns! This was the first time I had ever used a pattern to make our costumes too, so that was very interesting to say the least. I ended up finding two different ballgown patterns and a jacket with tails pattern. 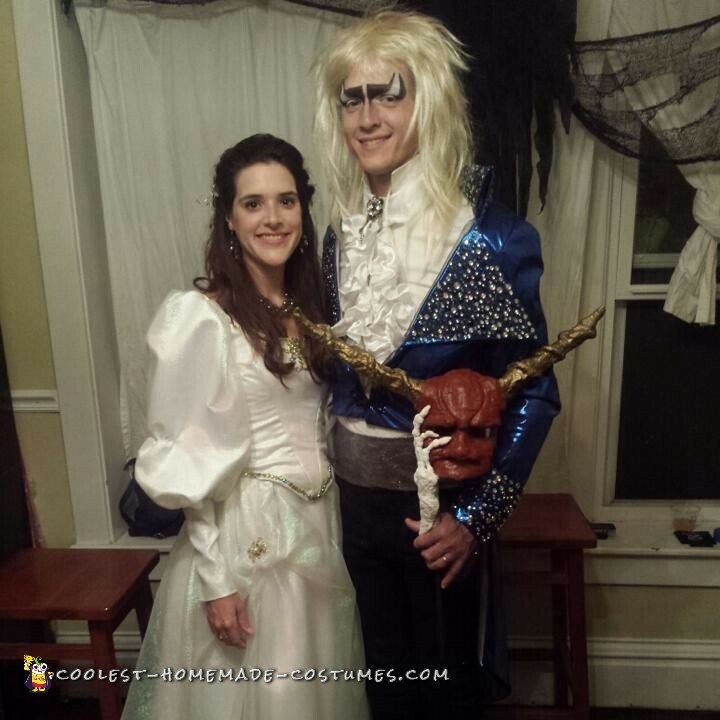 I started at the beginning of September working on the blue liquid lamet jacket for Jareth. I would say the most difficult part of making the jacket was sewing through liquid lamet! That stuff is basically kryptonite. I followed the pattern to a T and I think it turned out great! The Jacket took about a month to complete and then at the beginning of October I was able to start of Sarah’s ballgown. This ballgown was the most intimidating part of the whole getup, but I love challenges so I was ready to tackle it! I found silver lamet at the fabric store and used satan as the base. I used the ballgown pattern to cut out the lamet and satan and just layred the pieces before I sewed them. I would say the most difficult part of this costume were to giant puffly sleeves and the slippery lamet (did you know basically everything in the 80’s is made of lamet?) The ballgown took me an entire month of working tirelessly after work to complete. It was the most difficult thing Ive ever sewn and I am incredibly proud of it! The last two weeks before Halloween I decided to make Jareth’s mask (cause I didn’t have enough to do already, right?) I used a mask form, paper pulp, and plaster strips to complete this task. I make the skeleton hand with newspaper, wire, and plaster strips and painted the whole thing with acrylic paint. I then attached a wooden dowl rod with super glue and yet more plaster strips. It ended up being a tad heavy, but hey I didn’t have to carry it around all night and it looks amazing! In the last days leading up to the big night my husband and I hand painted little plastic gemstones to attach to his collar and the bodice of my gown. Also, my necklace I found at a flea market, Jareth’s brooch, Sarah’s brooche, and Sarahs earrings are all from the jewellery section at the craft store. I really had a lot of fun making these costumes and I hope you enjoy them!